Julia Nunes is performing at Bonnaroo this year. You can catch her performance on NPR. Julia Nunes' presence at Bonnaroo was brought about by a series of YouTube videos featuring her covers of popular songs on a ukulele. Her repertoire ranges from "Mr. Brightside" to "Jesus Walks" and "Build Me Up Buttercup," all tailored to fit the sweet strum of her instrument. She recently released an EP of original songs titled I Think You Know, accompanied by lo-fi music videos recorded in her bedroom. Hear Nunes perform live from the Bonnaroo Music Festival in Manchester, Tenn.
Gerald Ross turned up this gem. I've always wondered who played the incidental music on the Beverly Hillbillies TV show. Not the Bluegrass theme song - that was Flatt and Scruggs. Everyone knows that. But the "bubbly electric guitar" background music you heard when Ellie Mae descended the staircase in a sequined gown. Or when they sh...owed the Commerce Bank of Beverly Hills. It was Perry Botkin. Botkin had a long career in music - most notibly as Bing Crosby's musical director. Monster guitarist and uke player. Now I can finish learning the Ellie Mae tune. Ellie's tune starts at 3:04. But watch the whole clip, it's very cool. Some superb ukulele playing, too. Don't miss Ain't She Sweet. And check out the discussion over on the Fleamarket Music Bulletin Board. 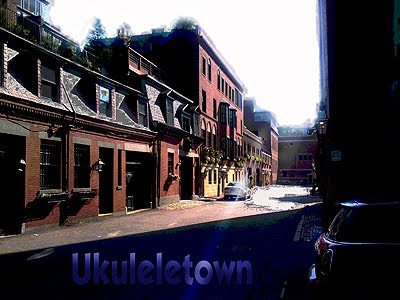 On this version the uke and drums are played by Abe Lagrimas Jr. and bass by Randy Wong. It's very much inspired by the original recording by Perry. 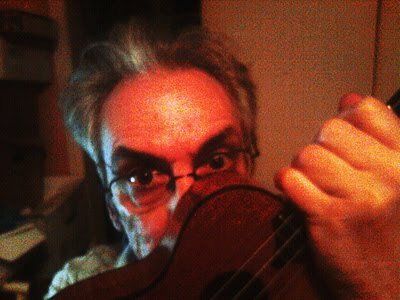 *Or better yet: the Cleveland Based Great Big and Original Musical Flea Ukulele Group. Listen to the Ink Spots' version. Shelley Rickey pointed us to this video produced by the Dulwich Ukulele Club of their "football ditty" and entry into the contest to select the anthem for the 2010 World Cup. Love it.